Long time no post! The weather here has been pretty nearly uniformly hot and mostly humid. Now and again we'll get a little much-needed rain. The showers are all scattered so it's terribly hit-and-miss, some areas getting dumped on and others still parching. Luckily we've had just enough (although if I don't water the flowers daily they scream and die). See that little building in the distance? That's McNeil's, also known (now) as the Indian Pass Raw Bar. When I was little we called it the "Little Store" because (1) it was little and (2) it was the only store anywhere near. It was rather like an old-fashioned general store but without the charm. Mom wouldn't get any groceries but emergency ones there because she said they cost too much. We got groceries in either Apalachicola or Port St. Joe. But I digress. 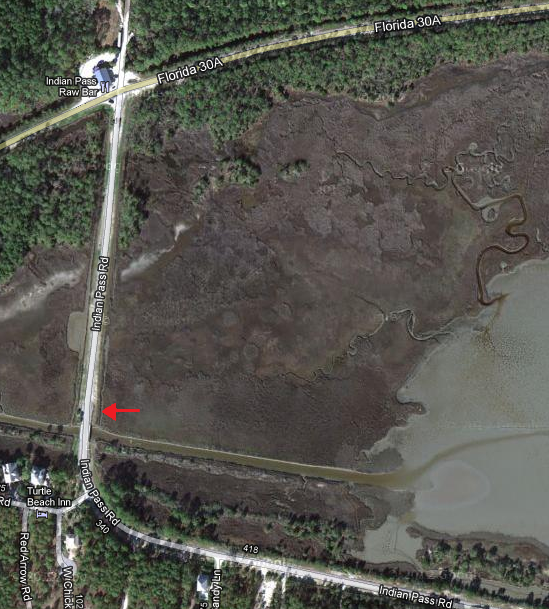 Below is a map of that part of Indian Pass. The junction at the top of the picture is McNeil's and I've drawn an arrow pointing to the approximate site where the photos were taken, looking north. Obviously this satellite photo was taken during a drought. The lagoon is to the right and the Gulf is to the south, just beyond the driveways you can see in the picture. The houses, at least the old ones which have been there for over a century, are on a ridge down the back of the little peninsula called Indian Pass. The Pass itself is at the very east end, between Indian Pass Beach and St. Vincent Island, a wildlife preserve. Deer have been known to swim across but I suppose most that try don't make it. The current is pretty strong and there are a lot of sharks. Oof. Back to the houses. As I said, the houses are all on a ridge on the north side of Indian Pass Road. 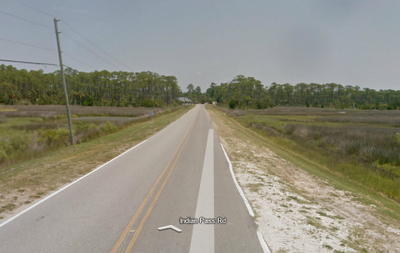 Across the street is an expanse of sea grass, sea oats, scrubby pines and palms and then the beach. New houses have been built on the lower area between the road and the beach. This seems very foolish to me. The old folks were much wiser. Not only did they build their beach houses on the ridge, but most of them were built just behind the crest so that the wind coming up from the water would be somewhat deflected up the slope and over the roof and not hit the house so directly. All of us owned "from water to water", that is, from the lagoon to the Gulf. The ground sloped down to sea-level behind the houses pretty rapidly and many people had little docks where fishing or crabbing could be done or a boat could be tied. The bottom was pretty shallow and one could go out castnetting for mullet. When I was a child we used to spend a month or more every summer living at the beach. The beach house itself is another story. We always knew that you oughtn't hunker down in place to weather a hurricane because the road was so low that you'd be cut off almost immediately. After one hurricane (and I can't remember which one - they tend to run together when you live in Florida) I drove down there with my father to check on the house. 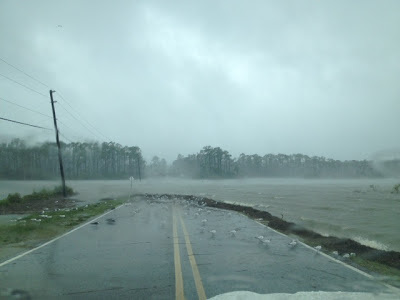 When we drove up the oyster shell driveway there was a debris line half-way up which showed us the high-water mark. I turned around at that point and looked out the Gulf, lying calmly in its usual spot, and tried to imagine breakers crashing over the palm trees and our house on an island. My nightmares of being trapped at the beach house during a hurricane started from that point. Believe it or not, while the details sometimes change, I still have those nightmares. It's a very vivid thing when you actually see it.